"We're evolving our Logix architecture into a rock-solid outcome-based platform." 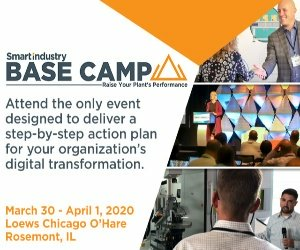 Rockwell Automation’s Frank Kulaszewicz discussed how the company’s connected products and scalable software solutions are helping users transition to a digital, IoT-centric world. Manufacturers and suppliers, who used to provide products and services, are now being challenged to deliver performance and productivity. "The Internet of Things is having a ripple effect, and changing how customers work with each other and how they work with their clients," said Frank Kulaszewicz, senior VP of architecture and software at Rockwell Automation. "Products are becoming more based on their results, outcomes and usage. They're also changing how users buy services, and customers are developing new processes and forming new partnerships. As a result, business models and technologies must evolve, too." Kulaszewicz delivered the second keynote address on the opening day of Rockwell Automation TechED 2018 this week in San Diego, where he reported that data-enabled products that can reach up to cloud-computing services are spurring development of new platform capabilities, such as for the Rockwell Automation Integrated Architecture product portfolio. "For example, we're evolving our Logix architecture into a rock-solid outcome-based platform," said Kulaszewicz. "Logix is already used in many applications worldwide. It's been used to build more than 1.3 billion vehicles, sort more than 40 billion packages, brew 36 billion barrels of beer, and produce 613 billion rolls of toilet paper. "Now, Logix is ready for IoT, but we're also protecting the product investments users have made in the past by maintaining its compatibility. So, even as Logix is updated, we can help users adapt to new technologies and tasks. Plus, at the same time we're simplifying Logix's design and maintaining its applications, we're also giving it add-on instruments and profiles to provide new capabilities for better outcomes." Kulaszewicz added that one of the company’s most important advances in its journey to The Connected Enterprise and simplified IoT access is its recent launch of FactoryTalk Analytics software, which achieves open, scalable analytics starting on the plant floor and joins with third-party devices and data sources for better outcome-based solutions. "We've done outcome-based design and have talked to customers for years, but now we're seeing three main trends where scalable analytics can help, including asset management, operations productivity, and safety and security," explained Kulaszewicz. "This is why we introduced new analytics capabilities 18 months ago, and introduced open, scalable FactoryTalk Analytics just last month." FactoryTalk Analytics DataView, which displays and redistributes the results of analyses to users at other levels. "These capabilities enables FactoryTalk Analytics to build predictive models and accomplish functions like predictive maintenance and closed-loop control," added Kulaszewicz. "The outcome economy is upon us, but we have tools that can help." To highlight how FactoryTalk Analytics and other innovative tools can assist users, several Rockwell Automation experts demonstrated the experiences of a hypothetical Rockwell Automation Global Energy (RAGE) drink company, complete with onstage mixing line and packaging lines. The team demonstrated the use of data processing and analytics, as well as the PTC ThingWorx IoT platform for augmented-reality visualization. RAGE personnel were able to visualize equipment status and operations on both lines, receive alerts and alarms, halt operations if needed, and respond more effectively based on specific faults identified within FactoryTalk Analytics, such as overload trips or excessive loads on motors. In addition, instead of taking a machine down as often as might have been required in the past, the RAGE team showed how an augmented reality headsets and tablet PC displays could be used to view the motors and drives on the mixing and packaging lines, monitor their performance, and make adjustments. The team stressed that these tasks can now be done without many of the configuration tasks that once were required, yet robust cybersecurity was maintained through logical patching and upgrade procedures; 24/7 monitoring of network operations and traffic; as well as real-time alerts of suspicious activities.